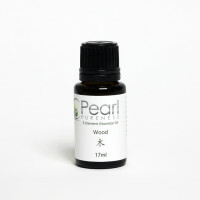 This Five Element Wood blend contains Certified Organic Australian essential oils infused with crystal gems. This beautiful exuberant blend represents growth and development. It is the element of the Liver in Chinese Medicine. It helps promote the expansion of knowledge, inspiration, expression and optimism. Green aventurine: This stone helps to releases old patterns, brings optimism, motivate and attack luck. It also increases the ability for self-development and strengthens self confidence.